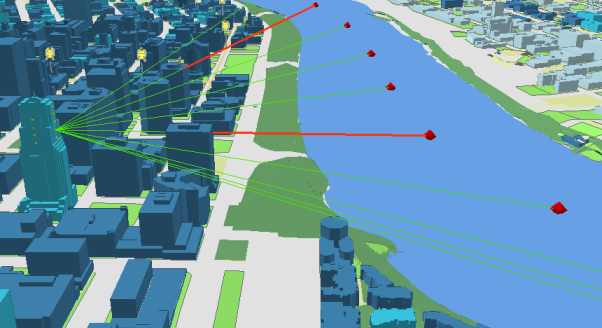 The ArcGIS 3D Analyst extension provides tools for creating, visualizing, and analyzing GIS data in a three-dimensional (3D) context. View GIS data on a 3D globe using ArcGlobe. 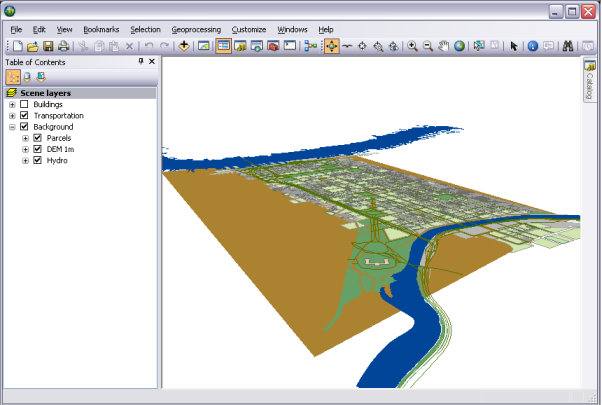 View GIS data within a 3D planimetric view using ArcScene. Query GIS data using 3D distances. 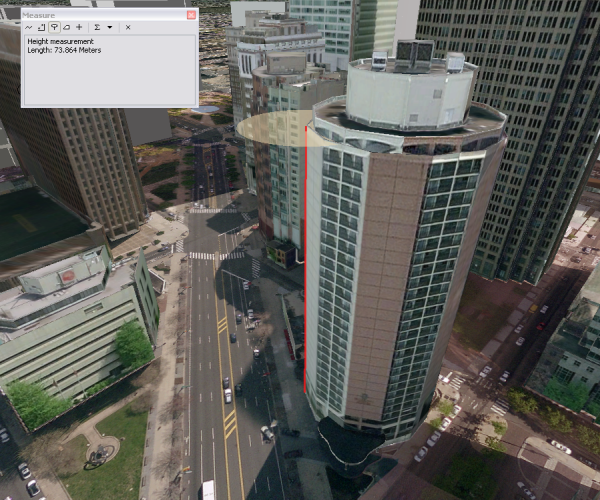 Ask 3D analytic questions, such as What is the impact of a proposed building on existing views? Example of line of sight analysis to see if and where the view of the river is obstructed from each floor of a proposed new building. 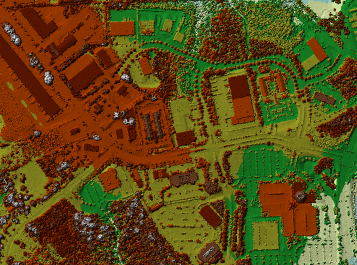 Build and maintain functional surfaces, such as a terrain dataset constructed from lidar. 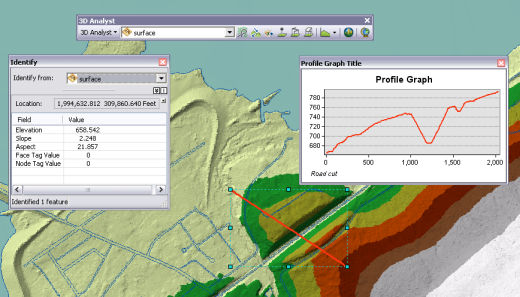 Query and analyze surfaces, such as slope and aspect. 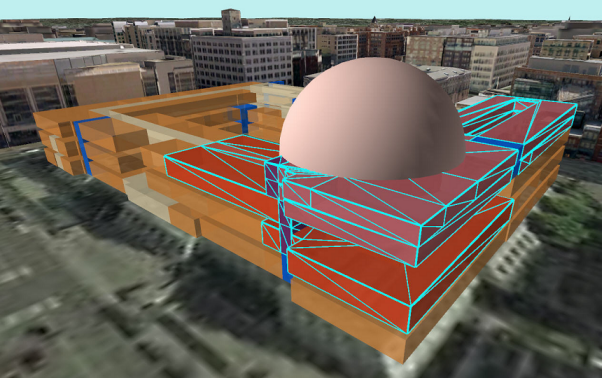 Import 3D data from multiple sources, such as multipatch buildings constructed in SketchUp. Import a variety of supported 3D models. In this example new multipatch features are created using the 3D Editing environment and interactively placing the imported 3D models. Edit and maintain 3D vector data, such as building interior transportation networks. 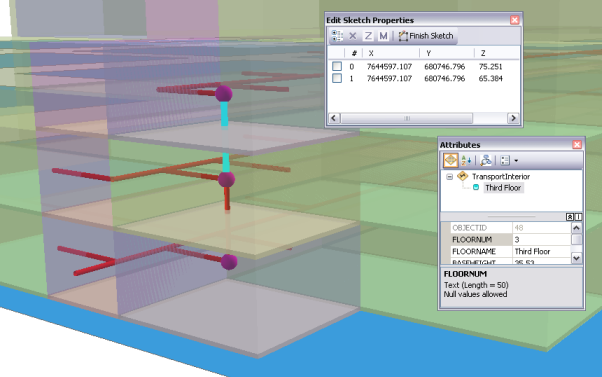 Use interactive tools to make 3D queries, such as measuring heights inside 3D. 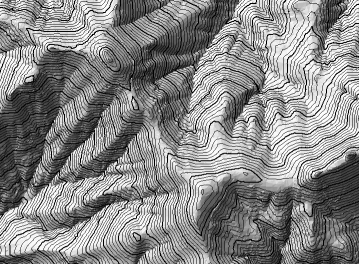 Create contour lines in 2D (ArcMap). Environmentalists, forestry departments, and civil engineers can use the ArcGIS 3D Analyst extension to understand and sculpt terrain to allow for events such as water runoff and flooding. 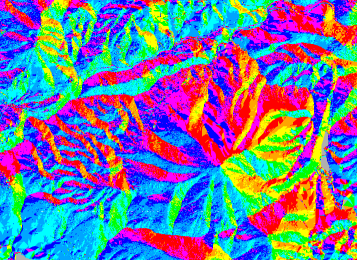 Mining companies, geologists, and researchers can use 3D Analyst capabilities to learn more about subsurface geological bodies, such as the 3D intersections of deviated boreholes and subsurface strata. Local governments, city planners, and military organizations can leverage 3D Analyst to ask complex 3D questions about man-made structures, especially in regard to both current and proposed lines of sight within an urban area. When shifting to a 3D viewing environment, there are several new concepts to be aware of. Additional symbology options available for vector features in 3D. Vector layers can be displayed as rasters for improved display performances. ArcGlobe uses caches to support fast display of large datasets. There are also other well-accepted 2D concepts that no longer apply. 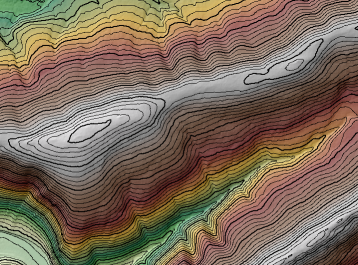 Layers in a 3D view are not just for display—they can also be used to describe the surface. This means that layers can have different roles within the 3D view. A 3D view extent cannot be described as a simple rectangular shape (as is the case for 2D) because you can look at the data from an oblique angle. This means the current extent of a 3D view must be handled in a different manner from 2D. The layer drawing priority is no longer as simple as the order in the table of contents. 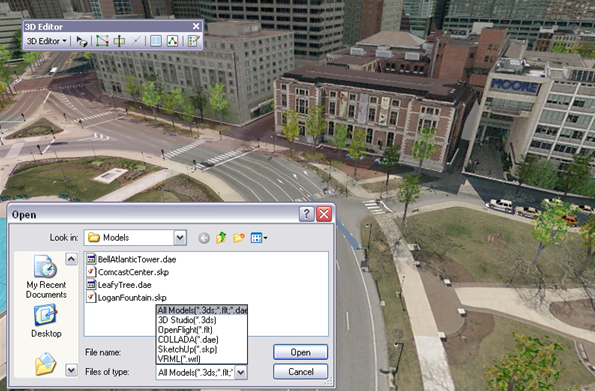 Two 3D visualization applications, ArcGlobe and ArcScene, are also part of the ArcGIS 3D Analyst extension. ArcGlobe gives you the power to tame voluminous data while fully employing all information the data can give you. 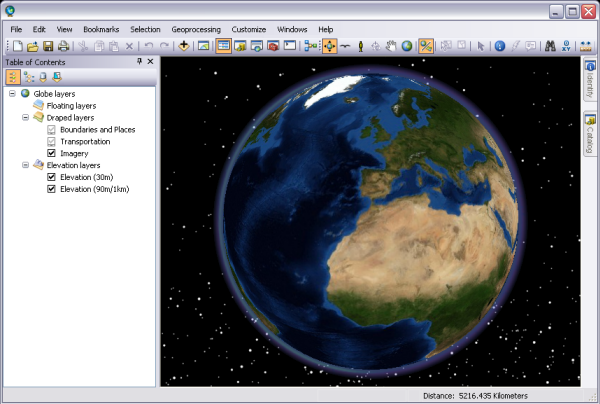 ArcGlobe displays spatially referenced data on a 3D globe surface, displayed in its true geodetic location. You can manipulate the globe, then investigate and analyze its data while viewing the globe as a whole, or regions within it. You can view data covering a global extent then seamlessly zoom into highly detailed, localized data. 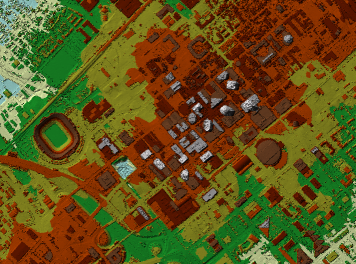 ArcScene manages your 3D GIS data, performs 3D analysis, and allows you to easily create 3D features, and display layers within a 3D planimetric view. 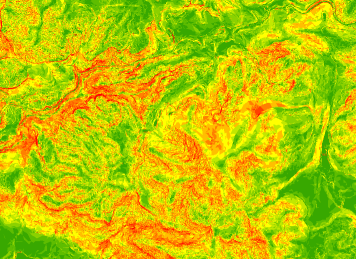 You can create 3D features from existing two-dimensional (2D) GIS data, or you can digitize new 3D vector features and graphics in ArcMap using a surface to provide the z-values. In ArcCatalog, 3D Analyst allows you to manage 3D GIS data and create layers with 3D viewing properties. You can preview scenes and data in 3D in ArcCatalog using the same 3D navigation tools you use in ArcScene. In ArcMap, 3D Analyst allows you to create new surfaces from your GIS data as well as analyze surfaces, query attribute values at a location on a surface, and analyze the visibility of parts of a surface from different locations. You can also determine the surface area and the volume above or below a surface and create profiles along a 3D line on a surface.